In 1981, Nellie Torres completed her Masters’ Degree with outstanding academic achievements from The University of Puerto Rico/Medical Science Campus as a Licensed Speech and Language Pathologist. Since the beginning she has embarked on a continuous search for the newest and most effective techniques she could apply for her therapies. It was not until 2004 that Centro Tomatis of Puerto Rico was inaugurated, offering the first sensory-auditory therapy on the island. 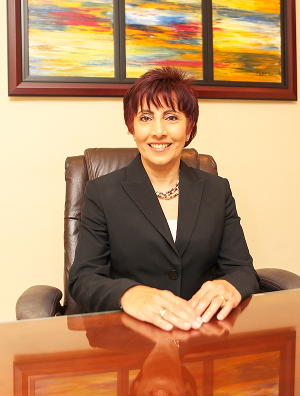 Nellie Torres was able to merge a unique series of specialized programs in Puerto Rico as a result of her continued professional development, attending different courses and acquiring numerous certificates, in addition to the experience gained from many years of hard work in this field. Our Director is considered an expert in developmental disorders. She is frequently interviewed by the island’s media, and many of her articles have been published in Puerto Rico, Latin America and the United States. She has given conferences in Costa Rica, Mexico, Panama and Ireland. Academia Fonemi was created in 2009 to develop communication and socialization skills in a preschool environment for children with childhood apraxia of speech, autism and other related disorders. During the same year a program for children with cochlear implants was incorporated with the goal of improving language in auditory processing and to develop the verbal communication skills. In 2011 the first and only clinic for Childhood Apraxia of Speech and Oral-Motor disorders was created. The NACE (Niños con autismo comunicándose efectivamente / Children with autism Communicating effectively) programs was created in 2012 to help children with autism develop skills in communication and socialization. By 2013, children with reading and writing problems began to receive assistance from the High Honors (Alto Honor) program. Throughout the years of growth and development the original concept of Centro Tomatis no longer describes our new vision. The time came to make changes that not only reflects the nature of our services, but that would allow us unlimited possibilities to continue growing. Based on our needs, Instituto Fonemi de Puerto Rico or Fonemi Institute of Puerto Rico was finally founded. An institute is a place for creation, education, research and specialized services. On the other hand, the word Fonemi is the Italian version for phoneme, the abstraction, representation, or mental image for the sounds in speech. The phonemes are the DNA or simple unit in which the language is developed. The Fonemi Institute of Puerto Rico specializes in the development of all communication-related areas such as: listening, speaking, reading, and writing. Speaking is not just the act of articulating sounds; it is the use of the language in its wider spectrum, including the social aspects of the human being. The Fonemi Institute of Puerto Rico goes beyond the Centro Tomatis de Puerto Rico or Academia Fonemi, the Childhood Apraxia of Speech and Oral Motor Disorders Clinic or any other therapy program we currently provide. The Fonemi Institute of Puerto Rico has been designed with all the programs and therapies mentioned before but it is committed to the creation of new materials and therapeutic approaches. It is also a place for research, training, orientation, education and professional development in communication disorders with the highest clinical and ethical standards. In the Fonemi Institute of Puerto Rico we aim for excellence in the creation, innovation, constant improvement and, above all, inspiration for the families of children with special needs.